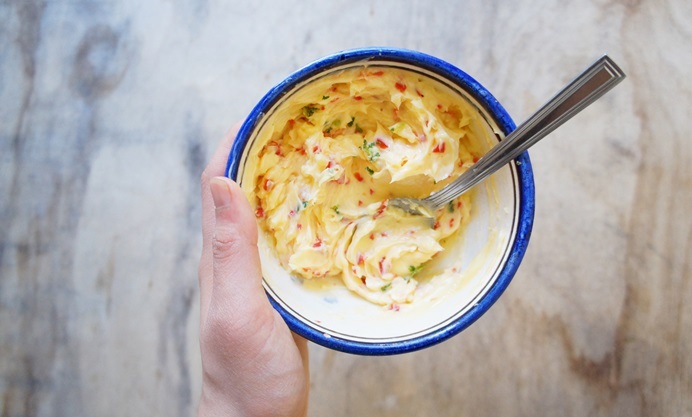 Shu Han Lee serves glorious new potatoes with a zingy chilli and lime butter, the ideal summer side for any occasion. As the butter keeps for a week and freezes for months, you can also make extra in little ramekins or roll into logs on cling film. It’s delicious melted over seared steak or grilled/steamed fish and vegetables. The sun is shining and the temperatures are finally hot enough for us to tuck away our jumpers and roasting trays. Nothing delights me more than tucking into fresh salad greens after months and months of stodgy root vegetables and cabbages. That said, I’m not ready to give up on the good old potato just because it’s summer. 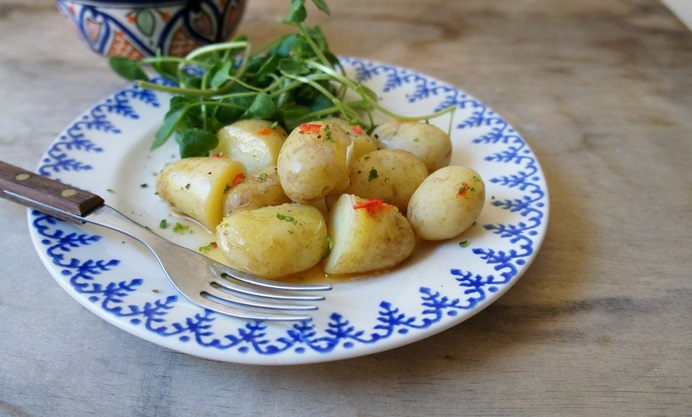 The new potatoes of this season are markedly different from their hearty wintry counterparts, especially these Pembrokshire Earlies from Wales. They’re much smaller, with a delicate, nutty, and almost sweet flavour. Because they taste so good, there is not much you need to do to them. I don’t even bother peeling their paper-thin skins off; in fact there’s wonderful flavour and nutrition in the skins. 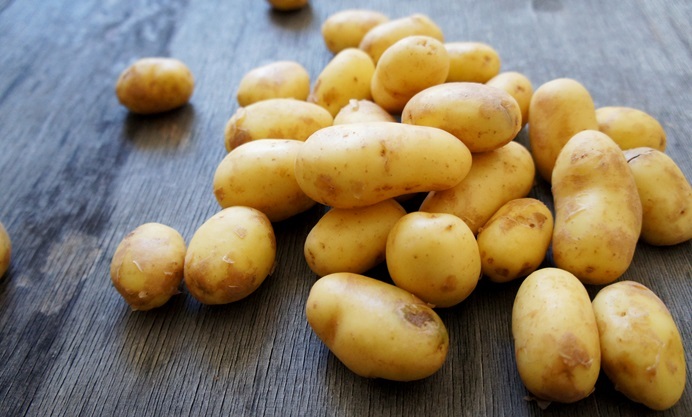 I simply give the potatoes a good wash, boil or steam them, and then stir in a dollop of butter, letting the butter melt over their warm skins. To change things up a bit, I often make flavoured butters. 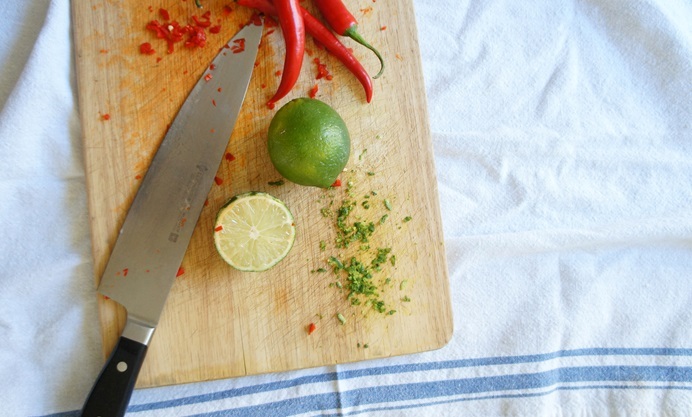 My current favourite combination uses chilli and lime for a bit of kick and a refreshing zing. 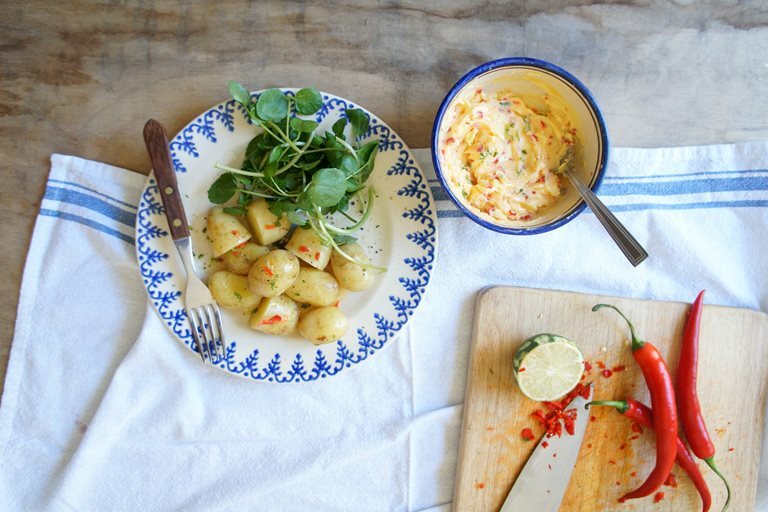 The spicy, tangy, and buttery Pembrokshire Earlies are a perfect accompaniment to a simple fresh salad, or lightly poached or grilled fish and meat. This recipe serves 3-4 people as a side, depending on how hungry you are! Shu grew up in Singapore and continues her nation's obsession with food in London, where she writes about food that's seasonal, British, yet Singaporean at the same time.